Sound Card: SoundBlaster Live! 5.1 D.E. 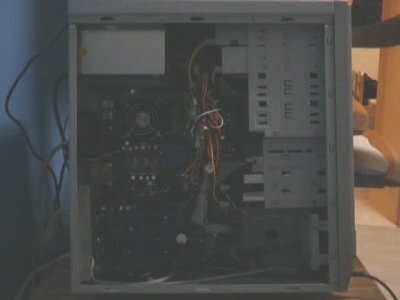 All of the components stated above resides in an ATX silver-grey box, and sits on top of a mini-table in my bedroom. 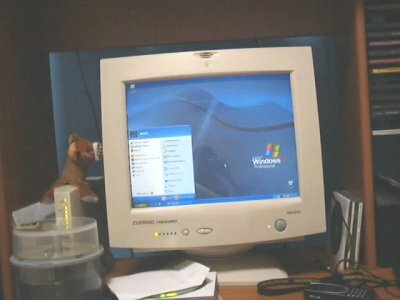 The tower unit was bought and built up in November 2001, meant to be a replacement for my dead Compaq (Pentium II 450 MHz) machine. It is based on the fastest AMD XP chips around then, the AMD XP 1600+, which runs at a clock speed of 1400 MHz (1.4 GHz). The core of the system, the AMD XP 1600+ chip, is known for it?s ability at equal the performance or even out perform an Intel Pentium 4 1.6a (1.6Ghz) which runs at a higher clock speed than it (200Mhz faster, to be exact). The new chip by AMD is based on the Quanti-Speed architecture, which allows the chip to run at a lower clock speed, but out perform a similar chip at a higher clock speed, while optimizing the performance of Microsoft?s latest Operating System, Windows XP, and hence the name, AMD XP. This new breed of AMD chip is also faster and runs cooler than the older ones, particularly the AMD Thunderbird, which is known for the amount of heat it generates. After ?burning in? the processor, ram and mainboard after a period of about 3 months, I decided to test the system on the limits of over clocking. Over clocking simply means running the system at a much higher speed than it was meant to support. 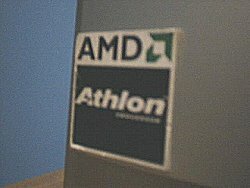 Like the Thunderbird, the AMD XP chips come with their L1 bridges unlocked by laser in the factory. So in order to over clock it effectively by the means of tweaking the CPU Ratio (Multiplier settings), I had to unlock the chip with the help of a friend. We thought that the ?pencil shading? method used for the Thunderbird was inappropriate for the XP chip, as the pencil shading will eventually be deteriorated by heat and prolonged usage. Thus, the joining of the L1 Bridges by using conductive ink was employed. We eventually managed to over clock the system bus from 133 MHz to 141 MHz and the processor, from 1400 MHz to a whopping 1620 MHz, a total of 220 MHz increase of raw processor speed, with no vcore voltage tweaking (my mainboard does not support that feature) . Surprisingly, the Kingston ram with Nanya chipset was able to take the high FSB pretty well at stock voltage, as I heard that the Nanya chips don?t normally over clock as well as other chipsets such as Samsung. The processor is kept cool at all times by the high performance Cooljag full copper heat sink with a screamingly fast Delta Black Label. Next comes the graphics card. The GeForce 2 MX400 comes with 64MB of SD Ram on board, and was one of the fastest card during it?s time. My particular card comes equipped with TLC chipset for the rams, and a heat sink and fan unit for the Graphics Processing Unit (GPU). It is one of the few graphics card with the GeForce 2 chipset that comes with a heat sink and fan unit, which is particularly useful for long hours of gaming, when the card starts to get really hot. Stock speeds for the core/memory in MHz is 200/175, but I over clocked the card in search of better gaming performance to 230/190. Surprisingly, the card with the unheard of TLC ram manages to handle the high clocks very well. I was really impressed with the performance of the card in the 3D Mark 2001 SE, as it manages to cross the 3000 points barrier, which is impressive for a reference MX400 card. After over clocking, the card was hotter than ever, and to solve this problem, I mounted another two CoolerMaster fans to the bottom of the card ? a 5300rpm fan from a processor heat sink and a small north bridge fan. The mainboard is a budget piece of hardware in my rig. The Jetway 867AS with KT266 chipset is not actually new, but at least there are some goodies like a blue PCB and the setting of multiplier settings by using jumpers. It is also one of the few KT266 boards to support both SD Ram and DDR Ram, having 2 banks for both types. The shortcomings of this board is that it does not support voltage tweaking for various components such as processor core and ram, and that greatly hinders the system?s over clocking ability. This particular board also does not come with a motherboard monitor or PC Health, which allows the monitoring of mainboard and processor temperatures. The new board with the same model name that arrived in February had the PC Health function at POST, though.I chose Seagate hard drives for my rig as they were cheaper then, and are quite reliable. True, they are not as fast as IBM or Maxtor hard drives, but the RMA (Return Merchandise Authorisation) process is much more efficient than that of other companies. So far, I?ve had no problems with the two Seagates, and never regretted buying them. As for the optical drives, I figured out that having both a CD-ROM and a writer will make copying CDs easier. On-the-fly burning can be achieved with my LG CD-ROM and my CyQve writer, which features the JustLink buffer under run protection and JustSpeed, which detects the optimum reading/writing speed of the media. The writer also comes with a 2MB buffer on board for optimum writing process. Also, with on-the-fly burning, the hard disk will not be fragmented prematurely, due to the fact that data is not copied to the hard disk for the burning process to be completed. The casing is pretty much just a square-like frame with sliver-grey face plates and side panels. Sad to say, the casing is also a budget piece of hardware. Due to its inherent shape, it is hard to remove the hard disks without having to resort to removing the graphics card first. Fortunately, it is quite easy to reach the IDE connectors and the multiplier jumpers on the mainboard. For better cooling, I added 2 casing fans ? intake at the front of the casing, and exhaust at the rear. I also run the casing without the side panels, which gives me instant access to the components, but also some cleaning chores to do every month.